Emirates is the world’s biggest airline by international passenger traffic, serving 144 cities in 81 countries from its hub in Dubai. Operating the world’s largest fleet of Airbus A380 and Boeing 777 aircraft, its main activity is the provision of commercial air transportation services with annual revenues of over AED88 billion. 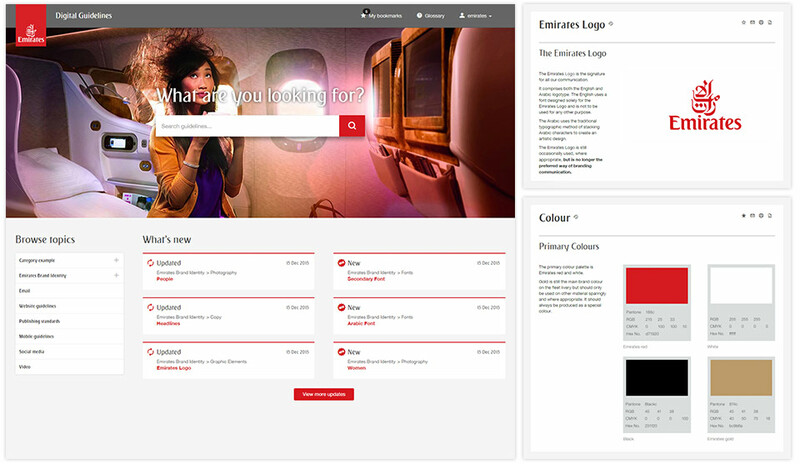 Emirates has over 2,000 stakeholders, agencies, customers and organisations using the Emirates brand. The Group needed consistency and to reduce errors and pressure on the marketing and digital teams. PENSO created a “Development Kit”, that allowed us to research, design, cost and scope the whole project before we embarked on the development of the world’s best brand and marketing guidelines. The development of the brand guidelines digital platform has allowed PENSO to deliver the world's best digital brand guidelines channel for many clients, packaged up as a SaaS offering: Conformly. IAG Insurance Group believes that, with the evolution to driverless cars, there will be almost no accidents and therefore very little need for car insurance at some point in the future. Considering that car insurance makes up over 70% of IAG's revenues, IAG needed a way to innovate, so they created IAG Labs, an internal "product disruption" lab.